What a beauty – a light, fresh and delicious chicken and mango salad! Fruit and chicken are tasty together. 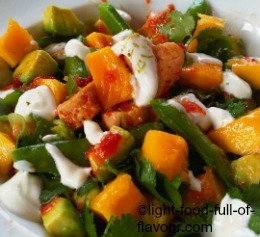 In this salad the sweetness of the mango is combined with a kick from a chilli sauce that you toss the chicken in. 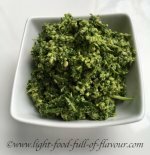 Add to this crunchy sugar snap peas and velvety avocado and you are in for a treat. Mangoes are low in fat and a great source of beta-carotene. Avocados are full of heart-healthy monounsaturated fat and rich in vitamin E.
Sugar snap peas are low in fat and have a high fibre content that helps to make you feel fuller for longer. They also contain a lot of different vitamins and are rich in iron. Note: Don’t be too forceful when grating the zest of citrus fruit. You only want the very outer layer of the fruit, not the bitter pith, the inner white part. I find that it’s worth investing in some really good graters with different coarseness. You want a fine grater for citrus fruit. 1. Bash the chopped chilli and garlic into a paste in a pestle and mortar. Mix in the sliced lemongrass, fish sauce, honey and oil. 2. Add the grated zest of 1 lime to the yogurt. Leave to the side. Put a pan with some salted water on to boil for the sugar snap peas. 3. Add a bit of oil to a large frying pan over a medium-high heat – I use coconut oil. Season the cubed chicken with some salt and black pepper and fry until nicely browned and cooked through. Remove from the heat and add the chilli sauce to the pan, tossing the chicken until all the pieces are coated with the sauce. 4. Add the sugar snap peas to the boiling water. Reduce the heat and simmer the sugar snap peas for 2 minutes. Remove the pan from the heat and rinse the sugar snap peas under cold water to stop them from cooking any further. 5. Add the lime juice to a bowl. Halve, de-stone, peel and dice the avocados. Add the diced avocado to the bowl with lime juice and toss. Place the cubed chicken, mango, avocado, sugar snap peas, spring onions (scallions) and fresh coriander in a salad bowl and mix together gently. Serve the chicken and mango salad with the yogurt with lime zest.